Cheryl Perkins is a thought leader in innovation and a creative catalyst in brand-building initiatives for companies looking for that innovative edge. In 2006 Business Week magazine chose Cheryl as one of the a Top 25 Champions of Innovation in the world. She was also named as a top executive driving vision within the consumer goods industry (Visionaries 2006) by Consumer Goods Technology magazine. 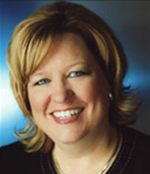 With over 20 years experience directing growth and innovation, Cheryl most recently served as the Senior Vice President and Chief Innovation Officer for Kimberly-Clark. She ran the company’s innovation and enterprise growth organizations, including research and development, engineering, design, new business, global strategic alliances, environment, safety and regulatory affairs, and oversaw innovation processes, systems and tools. She has ten U.S. Patents and several more pending. Cheryl brings her expertise to Innovationedge, creating new strategic business opportunities for companies seeking a competitive advantage across key businesses to ensure long-term growth and deliver a continuum of sustainable innovative solutions. Few consultants are able to do what Cheryl does: Identify and transform insights, designs, technologies and capabilities into total solutions and new-to-the-world innovations.